Canopy House — A Parallel Architecture. Austin, Texas. 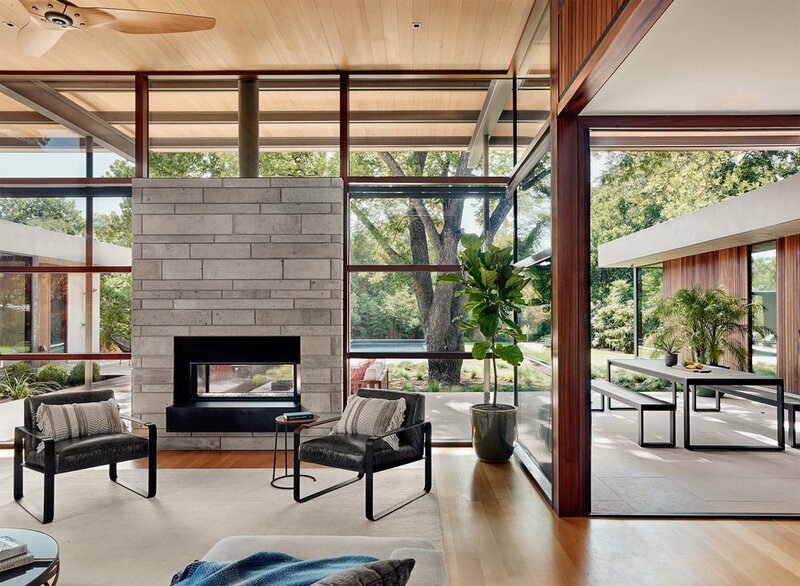 As the city of Austin grapples with exponential growth, rising land values and skyrocketing construction costs, the previously insulated world of custom single-family architecture has been forced to become more adaptive, efficient and responsible. Years prior to the clients’ purchase of the land, a developer razed the original home, allowing the lot to return to it’s natural meadowed state. A series of mature oak and pecan trees dot the deep rectangular lot, prompting the architecture to carefully navigate their protected root systems. The resulting design employs a large canopy structure, economically constructed but carefully proportioned and detailed, to provide for a series of outdoor living spaces arranged around a large central courtyard. The home’s roof canopy and overhangs are configured to take advantage of optimal solar orientation and prevailing breezes, while the building footprint is carefully threaded between the towering oak and pecan trees to maximize beneficial seasonal shading. Opposing low slung sleeping wings run parallel with the north and south boundaries, providing sanctuary to a long series of terracing lawns, gardens, courtyards, and a glassy central living space. Wood clad bridges house kitchen and dining program while the thin, structurally expressive canopy structure floats over the lower roofs and offers deep cover to the front entry and western facing rear patio. A second canopy structure occupies the southwest corner of the property, it’s deep overhangs sheltering the pool and lawn from the intense setting sun. Given the hot Texas climate, these deep shaded patios with generous connections to the indoors are enjoyable year-round and nearly double the amount of living space in the home.